Reviving patients who wind up in the emergency department after overdosing on heroin or painkillers is as routine these days as stitches. Illinois hospitals have seen a dramatic uptick in the number of patients overdosing on opioids: ER visits statewide in the first nine months of 2016 climbed 77 percent compared to the same period in 2015. The steepest rise was related to heroin, the Illinois Department of Public Health says. On average, opioid overdoses killed about five people every hour across the U.S. in 2016, federal data shows. So far, statewide hospital executives say the Affordable Care Act has largely insulated them from the cost of treating patients who overdose. The 2010 law mandated that people have insurance, fueling a spike in coverage and helping hospitals—particularly those that treat a lot of poor and uninsured patients—get paid for care they previously provided free or for little reimbursement. But now that Congress has repealed the part of the ACA requiring that individuals have health insurance or pay a fine, hospitals could be in for some sticker shock if their patients drop coverage, then wind up in the ER needing to be resuscitated from an overdose. 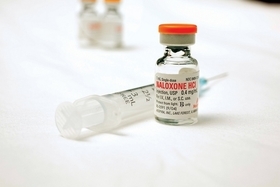 Some patients who overdose are revived quickly with a reversal drug like naloxone, either by emergency responders armed with a nasal spray version or through an IV in the ER. But depending on how fast they reach the hospital, and what kind of opioid they took, others may be put on a ventilator to help them breathe. They can wind up in the hospital for days, perhaps weeks, escalating costs even more. Hospitals might have to eat those bills instead of sending them off to insurance companies to get paid. That would be a significant hit to their bottom lines when you consider this: The average cost to treat overdose patients admitted to hospital intensive care units climbed from $58,517 in 2009 to $92,408 in 2015—a 58 percent hike, according to a 2017 study that analyzed 162 hospitals in 44 states. "Whether it's putting someone on a respirator or an IV drip, hospitals are obligated under the law to provide emergency services," says Juliet Sorensen, co-founder of the Northwestern Access to Health Project at Northwestern University. "Nothing is free. The money has to come from somewhere. It could result in services being cut." Nationally, President Donald Trump has declared the opioid crisis a public health emergency. In Chicago, it has hit the hardest on the West and South sides, often along the Eisenhower Expressway, known as the Heroin Highway. Public health officials blame fentanyl—a powerful opioid typically used for chronic pain or cancer that's up to 100 times stronger than morphine—for the biggest jump in opioid-related deaths here. In 2017, the Cook County Health & Hospitals System, which includes flagship Stroger Hospital on the Near West Side, treated 4,000 to 5,000 patients whose chief complaint was related to opioids, up from about 1,000 people in 2006. In 2017, opioid-related cases cost about $25 million. Each case on average cost just over $6,000, including overdose revivals in the ER and hospitalizations. The tab can climb quickly when doctors treat a handful of opioid cases a day. But 84 percent of these patients at Cook County Health have insurance at a system that's greatly benefited from the ACA. In 2013, 54 percent of patients were self-pay, which typically means they were uninsured. Dr. Steven Aks is a toxicologist and an emergency room physician at Cook County's Stroger Hospital. "We've seen quite the range of folks coming in with overdoses," says Dr. Steven Aks, a toxicologist and an emergency room doctor at Stroger. "Young kids from the suburbs that come in the city and use, people from our community that have been using heroin for years." To get a handle on the problem, the county system has rolled out a number of initiatives. It launched a South Side community triage center, with plans to add one on the West Side. It also wants to certify more doctors to prescribe drugs like methadone to help opioid users kick their addictions. Cook County Jail detainees who doctors identify as having an opioid-use disorder get the overdose antidote naloxone upon release. 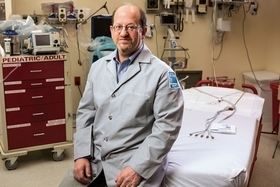 At Loretto Hospital, on the West Side, 1 in 3 patients visit the ER with an opioid-related issue, whether it's an overdose or a condition exacerbated by their addiction, such as asthma flareups. That's because heroin, for example, can reduce the number of breaths a person takes per minute. The hospital, which offers inpatient and outpatient addiction therapy, treated about 2,000 patients for opioid-related conditions from July to January. Of the roughly 1,200 people who were hospitalized, nearly 40 percent were readmitted, underscoring the deep grip of addiction. That's a problem for hospitals, too, because the federal government financially penalizes them if patients come back too quickly after they're discharged. "We have frequent flyers despite what help they get," says Dr. Sandeep Mellacheruvu, who runs Loretto's behavioral health and addiction services. It's difficult for Dr. Jay MacNeal to put a price tag on the amount of opioid-related care at Mercyhealth. The health system with facilities spread across northern Illinois and southern Wisconsin includes a hospital in Winnebago County, home to some of the highest rates of opioid-related ER visits and hospitalizations in Illinois. MacNeal ticks off the chain of workers impacted by the crisis: 911 dispatchers, EMS providers, doctors and nurses in the ER, rehab coaches. The list goes on. "We know it's very expensive, and we know we continue to see these patients," says MacNeal, Mercyhealth's emergency medical services director. Compared to Chicago, the opioid crisis looks different in rural Illinois. There are fewer doctors in general, and those who do have practices are spread out. This has potentially contributed to the flurry of opioids: If doctors know patients can't come back every few days to refill their prescriptions, they sometimes prescribe more pills at a time. Rural areas also have fewer physical therapists to help patients manage pain without narcotics. Residents have more factory and farm jobs than desk jobs, potentially making them more prone to injury, notes Dr. Nirav Shah, director of the Illinois Department of Public Health. Springfield-based Memorial Health System, which has hospitals big and small in rural and suburban areas, hasn't been financially hit hard by the opioid crisis, says Chief Medical Officer Dr. Rajesh Govindaiah. "But we are seeing plenty of negative impacts in our community," he says. To combat them, Memorial physicians now use a statewide online prescribing system to track their patients' medication patterns. Still, there's a major obstacle. Even if a person survives an overdose in Illinois, there's a shortage of outpatient care clinics to help them kick the habit. Health care providers can't act fast enough. State officials project that in 2020, the opioid epidemic will kill more than 2,700 Illinoisans—a nearly 40 percent spike from the 1,946 overdose deaths in 2016. "What it costs hospitals to reverse an opioid overdose" originally appeared in Crain's Chicago Business.